How are reinforcement bars numbered after they are modified in Advance Concrete? Advance Concrete offers the possibility of numbering the reinforcement bars, after modifying some properties, such as length, diameter, or steel grade. This option is very useful when working on complex projects with a large number of reinforcement bars. This functionality can be accessed from the AC Instruments submenu, found on AutoCAD's Ribbon, using the Preference, Numbering tab. This option is usualy used when in a drawing there are multiple bars having the same mark. 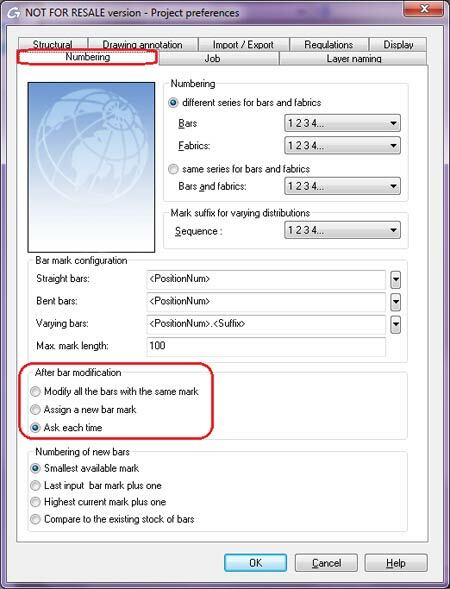 The Modify all the bars with the same mark option is used when the modification made on a bar must be applied to all the reinforcement bars with the same mark. If the change is only for a single reinforcement bar, the Assign a new bar mark option must be used, so that the modified reinforcement bar has a new mark and the others remain with the initial marks. 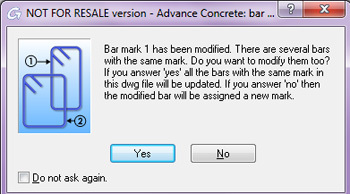 The Ask each time option applies when the user wants to be prompted to choose whether to "modify all bars with the same bar mark" or "assign a new mark".